The Voyage is Endeavour College’s rite of passage program that acknowledges the desire adolescents have for challenge, adventure, initiation, direction and guidance during their transition from adolescence to adulthood. The Voyage program has been running at Endeavour College since 2007 and was initially inspired by The Rite Journey program that focused on the students’ social, emotional, physical and mental health as they progressed from adolescence to adulthood. The Voyage program is run for all Year 9 students through the Health and Physical Education subject. The classes are single gender, run by a teacher of the same gender. The Calling – preparing for The Voyage: In this ceremony on the first day of Year 9 the students complete a group challenge. This is a hike around Anstey Hill, that includes time for them to set goals for the year, reflect on how they will treat others using the Endeavour Way Values of Love, Courage, Forgiveness and Hope in their Voyage classes. The Departure – beginning The Voyage: In this ceremony the College invites the students’ families to join them in celebrating the start of The Voyage. On that night the parents learn about the program, meet the Voyage teachers and give their blessing for the year. The students share a letter with their parents in this ceremony thanking them for their childhood and opening up about the challenges ahead. In a balloon release The Voyage begins and ‘letting go’ of childhood is the focus. The Adventure – challenge accepted: This ceremony is based around a week-long camp in The Grampians, Victoria. During this week the students and staff are set a number of challenges to attempt; from hiking to rock climbing to camping on their own for a night. This occurs at the end of the year in Term 4 and is a highlight for all. The Arrival – Looking back and Looking ahead: in this ceremony parents and families are invited back to celebrate the year that was and to look ahead to senior years at Endeavour. At ‘The Arrival’, the parents have an opportunity to write a letter back to their children expressing thoughts on how they have grown throughout the year. This is a graduation from Middle Years at Endeavour College and is a powerful and perfect way to conclude the year. The Voyage Program is unique in a student’s school life at Endeavour, not just for the content that it covers, but also for the family focus the program promotes. Mr Crook explains, “A student’s support network is such a crucial part of their development, this network really comes into its own during the tricky teenage years. The students are in a ‘no man’s land’ – in that they are not children, but are not yet adults. They are forming their identity that has been based around the family for so much of their life, but now friends seem to be more influential. 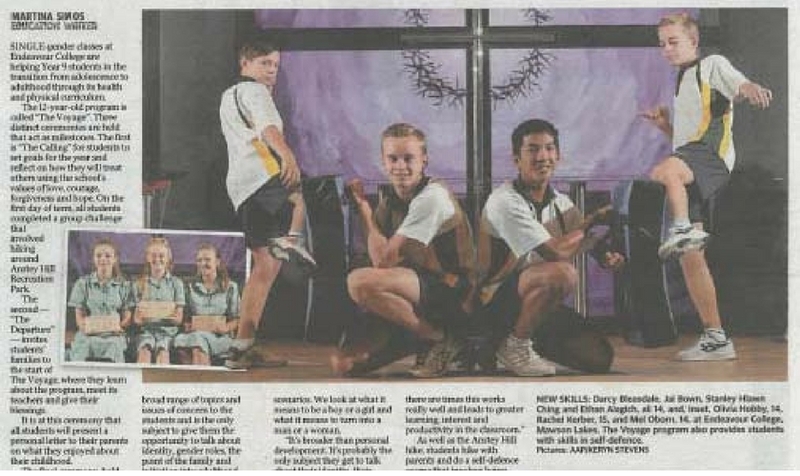 The Voyage also featured in a story in The Advertiser on 13 March 2018. Click here to read the article.